These pumpkin & zucchini fritters are perfect either as a snack or as a main meal served with a salad. They are gluten, dairy and full of healthy wholefoods plus infused with cilantro and thyme essential oils. I love to make a big batch of these on the weekend to enjoy over a few days. 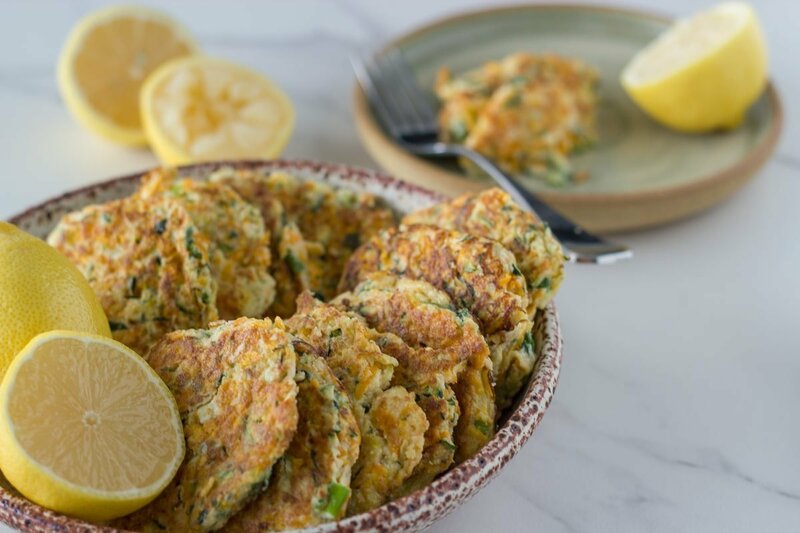 I am a big fan of fritters and these pumpkin & zucchini fritters are right up there with my quinoa fritters, cauliflower fritters and my zucchini & sweet potato fritters. I love how easy these fritters are to make and that you can enjoy them as either a snack or appetizer or as part of a main meal. 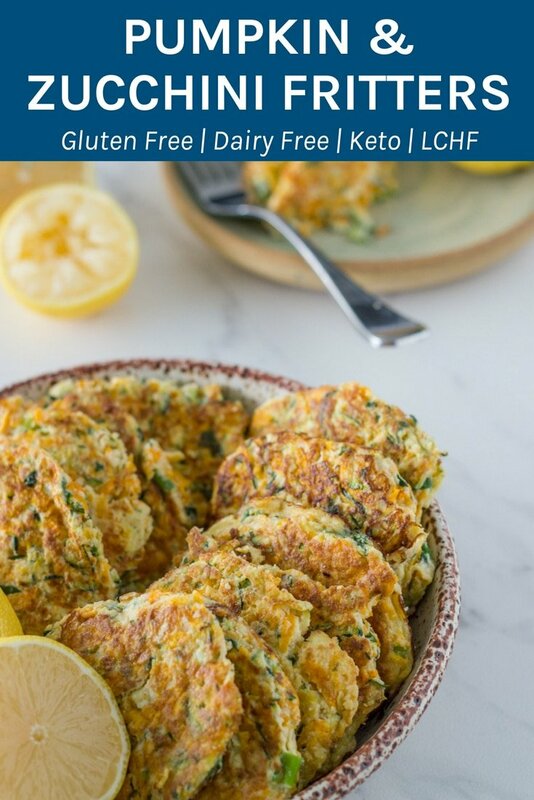 These fritters tick all the boxes as well, they are gluten free, dairy free and suitable for keto, lchf and paleo. If you make this recipe, please let me know. I would love to see your creations over on social media land. the weekend to enjoy over a few days. 1. Add grated zucchini and grated pumpkin to a colander, add a pinch of sea salt, mixing through the zucchini and pumpkin. Let sit for at least 15 minutes, then squeeze out as much excess moisture as possible. 2. Add to a large bowl with the remaining ingredients (except the coconut oil), mixing thoroughly. 3. Add 2 tablespoons of coconut oil to a medium fry pan on low-moderate heat. Using a soup spoon, scoop out a heaped spoon of the fritter mixture and place in the fry pan and flatten a little. Place as many as you want in the fry pan, making sure the edges don’t touch. (I made my fritters around 6-7cm diameter). 4. Cook for a few minutes on each side, until lightly golden and drain on paper towels. 5. Then repeat until you use up all the fritter mixture. You may need to add more coconut oil in between batches. 6. Serve with a salad or enjoy on their own as a snack. Previous Post: « Chocolate Nutty Fat Bombs – Keto & LCHF approved! Thanks Glenn. Sorry I have fixed that all up now. Yes you can substitute pumpkin for sweet potato. I have never mixed these flavors but it sounds awesome and like a must try! I have made the zucchini and sweet potato fritter before which are a winner, so thought to try with pumpkin instead. 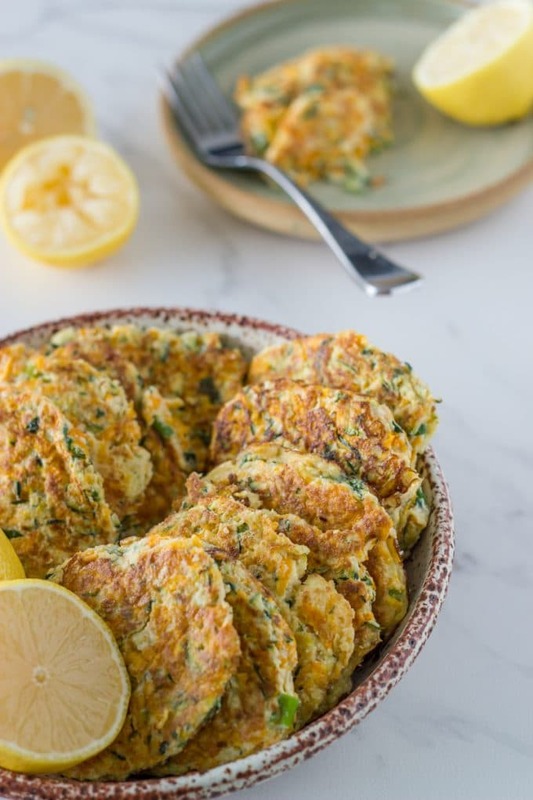 I’m always looking for ideas on how to use zucchini or summer squash, and these fritters look delicious. I also love that they are gluten free and keto! Thanks so much. 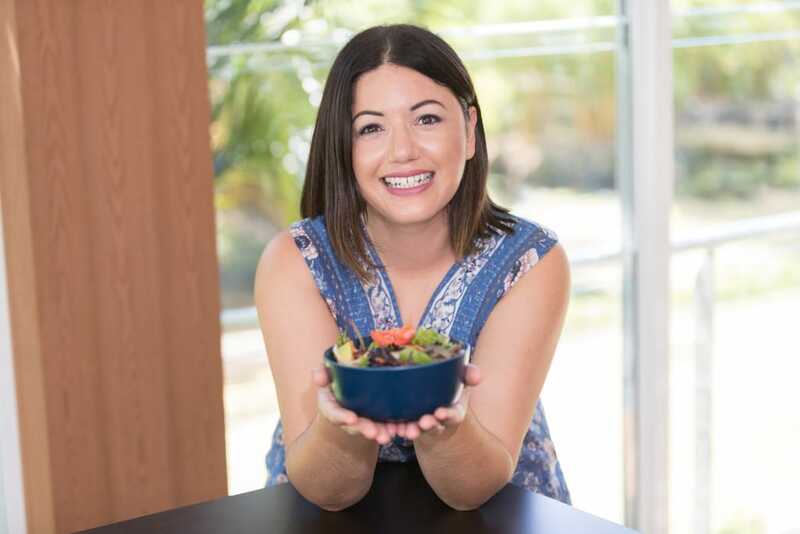 I have been sharing a lot more low-carb/keto recipes options lately. A tasty way to enjoy some veggies! Sounds like you have lots of great recipes in your cookbook. Congrats on getting that publshed! We love fritters and often make zucchini too. This sounds so yum. I love using pumpkin but have not tried fritters yet. My kids would love this -saving this for later. Can’t wait to try. 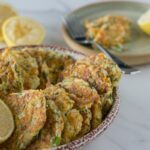 Yum, I absolutely love making squash fritters like these because they are so versatile for breakfast and dinner dishes. I had never thought about adding essential oils to them though, that is completely brilliant and really sets your recipe apart! Thanks so much Jenni. I find that the essential oils really give the fritters a really lovely flavour and it is a lot easier to add 1-2 drops instead of chopping up the fresh herbs. What a tasty way to eat your vegetables. This recipe would be a godsend for parents who can’t get their kiddos to eat their veggies. I’m looking forward to trying out your recipe. I know the family will love it. This is a great way to make everyone eat veggies and specially kids.will save this for later. It is a great way to get your veggie intake up!! This is a great healthy snack option. We’re trying to eat more fruits and vegetables, so these would work wonderfully. Love that you’ve combined pumpkin and zucchini. All the flavors sound awesome! It is such a good way to get your veggie intake up! These fritters looks delicious. It’s perfect side to any meal. I love it with plain salad and my kiddo likes to dip these to a tomato sauce. I’ll be trying your recipe for sure. Thanks so much! I hope you like them. I literally just made zucchini fritters for the first time ever today. These are next! These cakes look sooo good! I’ve never thought of using pumpkin with zucchini but I think it’s brilliant! Thanks Holly! It is a pretty combo! Wow! I love the combination of zucchini and pumpkin. These fritters sound delicious and they look amazing! Don’t have scales…any idea of the rough measurement in cups would be for pumpkin and zucchini? Thanks!